Casual games usually last 10 to 60 minutes; tournament games last anywhere from about ten minutes (blitz chess) to six hours or more. Chess is a two-player board game played on a chessboard, a checkered gameboard with 64 squares arranged in an eight-by-eight grid. Chess is played by millions of people worldwide in homes, urban parks, clubs, online, correspondence, and in tournaments. 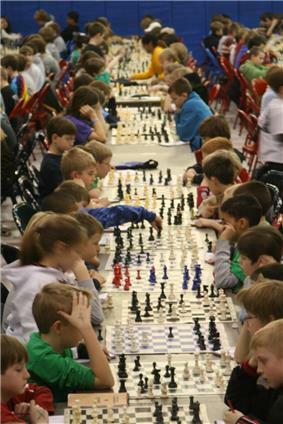 In recent years, chess has become part of some school curricula. Chess is believed to have originated in India, some time before the 7th century; the Indian game of chaturanga is also the likely ancestor of xiangqi and shogi. 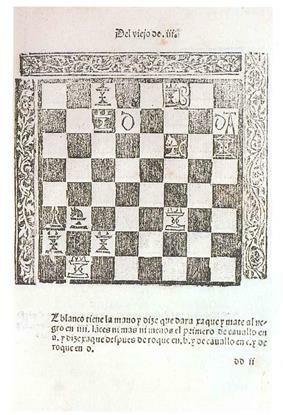 The pieces took on their current powers in Spain in the late 15th century; the rules were finally standardized in the 19th century. The first generally recognized World Chess Champion, Wilhelm Steinitz, claimed his title in 1886. The current World Champion is the Norwegian Women's World Championship, the World Junior Championship, the World Senior Championship the Blitz and Rapid World Championships and the Chess Olympiad, a popular competition among teams from different nations. There is also a Correspondence Chess World Championship and a World Computer Chess Championship. Chess is a recognized sport of the International Olympic Committee; some national sporting bodies such as the Spanish Consejo Superior de Deportes also recognize chess as a sport. Online chess has opened amateur and professional competition to a wide and varied group of players. 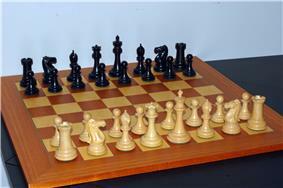 There are also many chess variants, with different rules, different pieces, and different boards. Since the second half of the 20th century, computers have been programmed to play chess with increasing success, to the point where the strongest home computers play chess at a higher level than the best human players. Since the 1990s, computer analysis has contributed significantly to chess theory, particularly in the endgame. The computer Deep Blue was the first machine to overcome a reigning World Chess Champion in a match when it defeated Garry Kasparov in 1997. The official rules of chess are maintained by FIDE (Fédération Internationale des Échecs), chess's international governing body. Along with information on official chess tournaments, the rules are described in the FIDE Handbook, Laws of Chess section. Chess is played on a square board of eight rows (called ranks and denoted with numbers 1 to 8) and eight columns (called files and denoted with letters a to h) of squares. The colors of the 64 squares alternate and are referred to as "light" and "dark" squares. 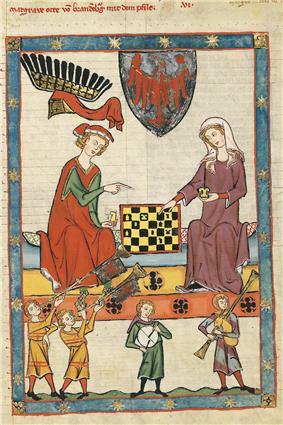 The chessboard is placed with a light square at the right-hand end of the rank nearest to each player, and the pieces are set out as shown in the diagram and photo, with each queen on a square of its own color. By convention, the game pieces are divided into white and black sets, and the players are referred to as "White" and "Black" respectively. 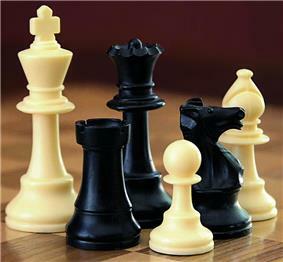 Each player begins the game with 16 pieces of the specified color, which consist of one king, one queen, two rooks, two bishops, two knights, and eight pawns. The "white" players always moves first. After the first move, players alternately move one piece per turn (except for castling, when two pieces are moved). Pieces are moved to either an unoccupied square or one occupied by an opponent's piece, which is captured and removed from play. 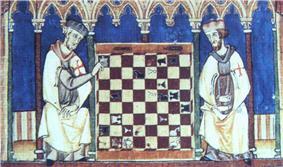 With the sole exception of en passant, all pieces capture by moving to the square that the opponent's piece occupies. A player may not make any move that would put or leave his or her king under attack. A player cannot "pass"; at each turn they have to make a legal move (this is the basis for the finesse called zugzwang). If the player to move has no legal moves, the game is over; it is either a checkmate (a loss for the player with no legal moves) if the king is under attack, or a stalemate (a draw) if the king is not. The pawn may move forward to the unoccupied square immediately in front of it on the same file, or on its first move it may advance two squares along the same file provided both squares are unoccupied (black "●"s in the diagram); or the pawn may capture an opponent's piece on a square diagonally in front of it on an adjacent file, by moving to that square (black "x"s). The pawn has two special moves: the en passant capture and pawn promotion. Neither the king nor the rook may have been previously moved during the game. 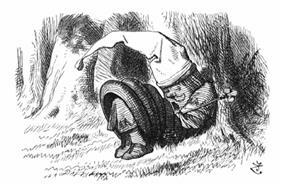 Note that castling is permissible if the rook is attacked, or if the rook crosses a square that is attacked. In casual games it is common to announce "check" when putting the opponent's king in check, however this is not required by the rules of the game, and is not usually done in tournaments. Resignation – either player may resign, conceding the game to the other player. It is usually considered poor etiquette to play on in a truly hopeless position, and for this reason high level games rarely end with a checkmate. Loss on time – in games with a time control, a player may also lose by running out of time, even with a much superior position. Forfeit – a player who cheats, or violates the laws of the game, or violates the rules specified for the particular tournament may be forfeited. In high level tournaments, players have been forfeited for such things as arriving late for the game (even by a matter of seconds), receiving a call or text on a cell phone, refusing to undergo a drug test, refusing to undergo a body search for electronic devices and unsporting behavior (such as refusing to shake the opponent's hand). Draw by agreement - draws are most commonly reached by mutual agreement between the players. The correct procedure is to verbally offer the draw, make a move, then start the opponent's clock. Traditionally players have been allowed to agree a draw at any time in the game, occasionally even without playing a move; in recent years efforts have been made to discourage short draws, for example by forbidding draw offers before move thirty. Stalemate - the player whose turn it is to move is not in check, but has no legal move. Threefold repetition of a position - this most commonly occurs when neither side is able to avoid repeating moves without incurring a disadvantage. The three occurrences of the position need not occur on consecutive moves for a claim to be valid. FIDE rules make no mention of perpetual check; this is merely a specific type of draw by threefold repetition. Insufficient material - a player may claim a draw if their opponent has insufficient material to checkmate, for example if the player has only the king left and the opponent has only the king and a bishop. Such a claim is only valid if checkmate is impossible. Chess games may also be played with a time control, mostly by club and professional players. If a player's time runs out before the game is completed, the game is automatically lost (provided his opponent has enough pieces left to deliver checkmate). The duration of a game ranges from long games played up to seven hours to shorter rapid chess games, usually lasting 30 minutes or one hour per game. Even shorter is blitz chess, with a time control of three to 15 minutes for each player, and bullet chess (under three minutes). 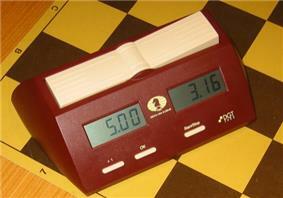 In tournament play, time is controlled using a game clock that has two displays, one for each player's remaining time. If a pawn moves to its last rank, achieving promotion, the piece chosen is indicated after the move, for example e1Q or e1=Q. Castling is indicated by the special notations 0-0 for kingside castling and 0-0-0 for queenside castling. An en passant capture is sometimes marked with the notation "e.p." A move that places the opponent's king in check usually has the notation "+" added. (The notation "++" for a double check is considered obsolete). Checkmate can be indicated by "#". At the end of the game, "1–0" means "White won", "0–1" means "Black won", and "½–½" indicates a draw. A few mostly older players still prefer descriptive notation, however it is no longer recognized by FIDE. After sacrificing a piece to expose Black's king, Botvinnik played 1.Bh5+ and Yudovich resigned, as mate is inevitable. Around 1200, the rules of shatranj started to be modified in southern Europe, and around 1475, several major changes made the game essentially as it is known today. These modern rules for the basic moves had been adopted in Italy and Spain. Pawns gained the option of advancing two squares on their first move, while bishops and queens acquired their modern abilities. 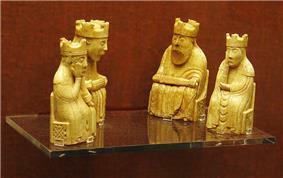 The queen replaced the earlier vizier chess piece towards the end of the 10th century and by the 15th century had become the most powerful piece; consequently modern chess was referred to as "Queen's Chess" or "Mad Queen Chess". These new rules quickly spread throughout western Europe. 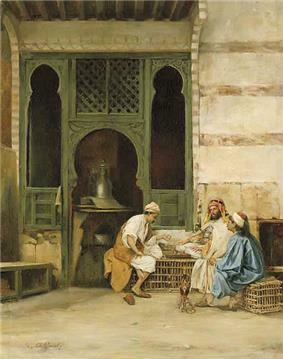 The rules concerning stalemate were finalized in the early 19th century. Also in the 19th century, the convention that White moves first was established (formerly either White or Black could move first). Finally the rules around castling were standardized – variations in the castling rules had persisted in Italy until the late 19th century. The resulting standard game is sometimes referred to as Western chess or international chess in order to distinguish it from its predecessors as well as regional versions of chess that evolved differently. Since the 19th century, the only rule changes have been technical in nature, for example establishing the correct procedure for claiming a draw by repetition. After the death of Alekhine, a new World Champion was sought. FIDE, which has controlled the title since then (except for one interruption), ran a tournament of elite players. The winner of the 1948 tournament, Russian Mikhail Botvinnik, started an era of Soviet dominance in the chess world. Until the end of the Soviet Union, there was only one non-Soviet champion, American Bobby Fischer (champion 1972–75). Botvinnik revolutionized opening theory. Previously Black strove for equality, to neutralize White's first-move advantage. As Black, Botvinnik strove for the initiative from the beginning. In the previous informal system of World Championships, the current champion decided which challenger he would play for the title and the challenger was forced to seek sponsors for the match. FIDE set up a new system of qualifying tournaments and matches. The world's strongest players were seeded into Interzonal tournaments, where they were joined by players who had qualified from Zonal tournaments. The leading finishers in these Interzonals would go on the "Candidates" stage, which was initially a tournament, and later a series of knockout matches. The winner of the Candidates would then play the reigning champion for the title. A champion defeated in a match had a right to play a rematch a year later. This system operated on a three-year cycle. Botvinnik participated in championship matches over a period of fifteen years. He won the world championship tournament in 1948 and retained the title in tied matches in 1951 and 1954. In 1957, he lost to Vasily Smyslov, but regained the title in a rematch in 1958. In 1960, he lost the title to the 23-year-old Latvian prodigy Mikhail Tal, an accomplished tactician and attacking player. Botvinnik again regained the title in a rematch in 1961. Following the 1961 event, FIDE abolished the automatic right of a deposed champion to a rematch, and the next champion, Armenian Tigran Petrosian, a player renowned for his defensive and positional skills, held the title for two cycles, 1963–69. His successor, Boris Spassky from Russia (champion 1969–72), won games in both positional and sharp tactical style. The next championship, the so-called Match of the Century, saw the first non-Soviet challenger since World War II, American Bobby Fischer, who defeated his Candidates opponents by unheard-of margins and clearly won the world championship match. In 1975, however, Fischer refused to defend his title against Soviet Anatoly Karpov when FIDE did not meet his demands, and Karpov obtained the title by default. 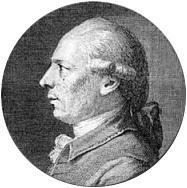 Fischer modernized many aspects of chess, especially by extensively preparing openings. Karpov defended his title twice against Professional Chess Association (PCA). From then until 2006, there were two simultaneous World Champions and World Championships: the PCA or Classical champion extending the Steinitzian tradition in which the current champion plays a challenger in a series of many games, and the other following FIDE's new format of many players competing in a tournament to determine the champion. 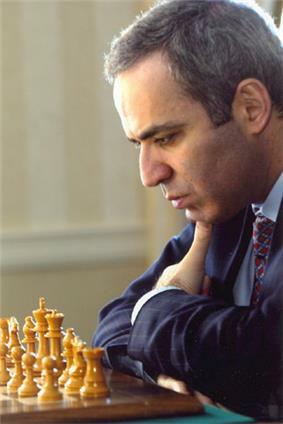 Kasparov lost his Classical title in 2000 to Vladimir Kramnik of Russia. The World Chess Championship 2006, in which Kramnik beat the FIDE World Champion Veselin Topalov, reunified the titles and made Kramnik the undisputed World Chess Champion. In September 2007, he lost the title to Viswanathan Anand of India, who won the championship tournament in Mexico City. 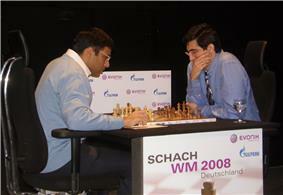 Anand defended his title in the revenge match of 2008, 2010 and 2012. In 2013, Magnus Carlsen beat Anand in the 2013 World Chess Championship. He defended his title the following year, again against Anand, and is the reigning world champion. 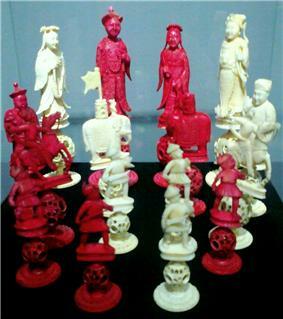 Chess is often depicted in the arts; significant works where chess plays a key role range from Thomas Middleton's A Game at Chess to Through the Looking-Glass by Lewis Carroll to The Royal Game by Stefan Zweig and Vladimir Nabokov's The Defense. The thriller film Knight Moves is about a chess grandmaster who is accused of being a serial killer. Chess is featured in films like Ingmar Bergman's The Seventh Seal and Satyajit Ray's The Chess Players. Chess is also present in the contemporary popular culture. For example, J. K. Rowling's Harry Potter plays "Wizard's Chess", while the characters of Star Trek prefer "Tri-Dimensional Chess". The hero of Searching for Bobby Fischer struggles against adopting the aggressive and misanthropic views of a world chess champion. Chess has been used as the core theme of a musical, Chess, by Tim Rice, Björn Ulvaeus, and Benny Andersson. Directmates: white to move first and checkmate black within a specified number of moves against any defense. These are often referred to as "mate in n" – for example "mate in three" (a three-mover); two and three move problems are the most common. These usually involve positions which would be highly unlikely to occur in an actual game, and are intended to illustrate a particular "theme", usually requiring a surprising or counter-intuitive "key move". Contemporary chess is an organized sport with structured international and national leagues, tournaments, and US Chess Federation and English Chess Federation) which in turn is a member of FIDE. FIDE is a member of the International Olympic Committee, but the game of chess has never been part of the Olympic Games; chess does have its own Olympiad, held every two years as a team event. Besides these prestigious competitions, there are thousands of other chess tournaments, matches, and festivals held around the world every year catering to players of all levels. Chess is promoted as a "mind sport" by the mental-skill games such as Contract Bridge, Go, and Scrabble. Grandmaster Garry Kasparov, former World Chess Champion, is considered by many to be one of the greatest chess player of all time. International titles are awarded to composers and solvers of chess problems and to correspondence chess players (by the Chess expert title used in the United States. In order to rank players, FIDE, Elo rating system developed by Arpad Elo. Elo is a statistical system based on the assumption that the chess performance of each player in their games is a random variable. Arpad Elo thought of a player's true skill as the average of that player's performance random variable, and showed how to estimate the average from results of player's games. The US Chess Federation implemented Elo's suggestions in 1960, and the system quickly gained recognition as being both fairer and more accurate than older systems; it was adopted by FIDE in 1970. [note 6] The highest FIDE rating of all time, 2881, was achieved by Magnus Carlsen on the March 2014 FIDE rating list. One of the most important mathematical challenges of chess is the development of algorithms that can play chess. The idea of creating a chess-playing machine dates to the 18th century; around 1769, the chess-playing automaton called The Turk became famous before being exposed as a hoax. Serious trials based on automatons, such as El Ajedrecista, were too complex and limited to be useful. Zermelo's theorem states that it is possible to solve chess, i.e. to determine with certainty the outcome of a perfectly played game (either white can force a win, or black can force a win, or both sides can force at least a draw). However, according to Claude Shannon, there are 1043 legal positions in chess, and the timeframe required to compute a perfect game puts this possibility beyond the limits of any feasible technology. Gliński's hexagonal chess. Three bishops per player are the norm for hexagonal variants. modern variations employing different rules (e.g. Losing chess), or different forces (e.g. Dunsany's chess), or non-standard pieces (e.g. Grand Chess), or different board geometries (e.g. hexagonal chess). One of the most popular modern variants is Chess960, where the starting position is selected randomly, rendering the use of prepared opening lines impracticable. The 11-category, game theoretical taxonomy of chess includes: two player, no-chance, combinatorial, Markov state (present state is all a player needs to move; although past state led up to that point, knowledge of the sequence of past moves is not required to make the next move), zero sum, symmetric, perfect information, non-cooperative, discrete, extensive form (tree decisions, not payoff matrices), sequential. ^ Without this additional restriction, which was added to the FIDE rules in 1972, it would be possible to promote a pawn on the e file to a rook and then castle vertically across the board (as long as the other conditions are met). This way of castling was "discovered" by Max Pam and used by Tim Krabbé in a chess puzzle before the rules were amended to disallow it. See Chess Curiosities by Krabbé. See also Pam-Krabbé-Rochade for the diagrams online. ^ The 50 move rule is not applied at FICGS. ^ At that time the Spanish word would have been written axedrez. The Spanish "x" was pronounced as English "sh", as the Portuguese "x" still is today. The spelling of ajedrez changed after Spanish lost the "sh" sound. ^ Susan Polgar, Special Chess Records (11 February 2008). Retrieved on 11 January 2009. ^ Zermelo, Ernst (1913), Uber eine Anwendung der Mengenlehre auf die Theorie des Schachspiels, Proceedings of the Fifth International Congress of Mathematicians 2, 501–4. Cited from Eichhorn, Christoph: Der Beginn der Formalen Spieltheorie: Zermelo (1913), Uni-Muenchen.de. Retrieved 23 March 2007. ^ Chess. Mathworld.Wolfram.com. Retrieved 5 December 2006. ^ Shannon, Claude E. XXII. Programming a Computer for Playing Chess. Philosophical Magazine, Ser.7, Vol. 41, No. 314 – March 1950. Available online at computerhistory.org PDF (175 KB) Retrieved 2006-12-06. ^ Deep Blue – Kasparov Match. research.ibm.com. Retrieved 30 November 2006. ^ Ericsson, K. A., Krampe, R. Th., & Tesch-Römer, C. (1993). The role of deliberate practice in the acquisition of expert performance. PDF (1.25 MB) Psychological Review, 100, 363–406. Retrieved 20 May 2010. ^ Gobet, F. & Chassy, P. (in press). Season of birth and chess expertise. PDF (65.8 KB) Journal of Biosocial Science. Gobet, F. & Campitelli, G. (2007). The role of domain-specific practice, handedness and starting age in chess. PDF (196 KB) Developmental Psychology, 43, 159–172. Both retrieved 2007-07-15.